He's popped the question. The ring is on your finger. Now comes the stressful part. You want to throw the wedding of your dreams, but you?re not Donald Trump's kid. What do you do? Statistics say the average wedding costs $20,000. Most young girls dream of the fairy tale wedding: long white gown, 8 bridesmaids, a sit-down dinner, the band everyone dances to. Many brides have been dreaming about their wedding day since childhood. These dreams come with an expensive price tag and the realisation of their fairytale day may be distant. Although weddings are very costly today, your dream day can happen. I am going to share some tips to cut corners and save money without making huge sacrifices. By taking the time to plan and investigate, you will be amazed at the amount of money that you save. Would you arrive at an interview for your dream job without prior preparation? No, you would not and that is why preparation and research will make your wedding a success without re-mortgaging the house! It's only natural to want the Cinderella fantasy wedding, complete with ice sculptures, a heavenly cake, and thousands of guests who've flown in from around the world to enjoy the accompanying dinner. It's only human to cry at the bill that this dream can rack up. Costs can add up quickly. Factor in the meal, the liquor, the music, the dress, the flowers, the photographer, the decorations and the dream wedding can seem way out of your league. But it doesn't have to be. How can the average person have a beautiful wedding with all the bells and whistles on a working person's salary? Perhaps the three letters/words that say it best are DIY (do it yourself!) Spending your life savings on your big day is crazy. You can have elegant, beautiful weddings without breaking the bank. Having a cheap wedding doesn't mean giving up style or sentimentality. It means using your imagination, using your own hands or the help of friends and family. Ask anyone you know to help out. Almost everyone will be happy to oblige. They'll be part of your special day which makes them special as well! This book will give you the best tips and tricks from the experts to cut costs without cutting class and sophistication. No one will know that your budget equals the grocery bill of a family of four. They'll be oblivious as they toast the new couple and enjoy a party to put all other party's to shame! We'll explore ways to save on all aspects of your wedding. Don't think you have to give up anything because it can all be covered. All it takes is the cooperation of your family and friends coupled with a little positive self-talk and perseverance. I have been married twice (don't worry, I got it right the second time!) For both of my weddings, I had amazing ceremonies and receptions for around $2,000. They were the talk of the town both now and then. Throughout this book, I will tell you what we did to save money and still have an amazing wedding / reception. Hopefully, you can gain some insight into a dream event for not a lot of money just like we had! 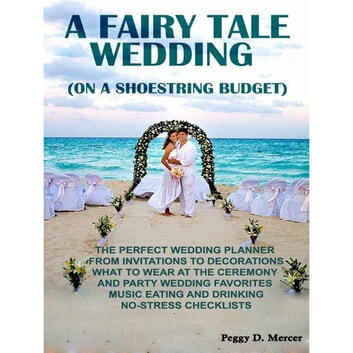 Enjoy your ebook"A FAIRY TALE WEDDING (ON A SHOESTRING BUDGET)!"